Started by two artists, EVENTgelical Productions Inc's mission is to educate the Omaha area by raising awareness and appreciation for all kinds of local art and expand local artist opportunities through events, educational activities, and community integration and outreach. A documentary on the post punk "No Wave" scene. 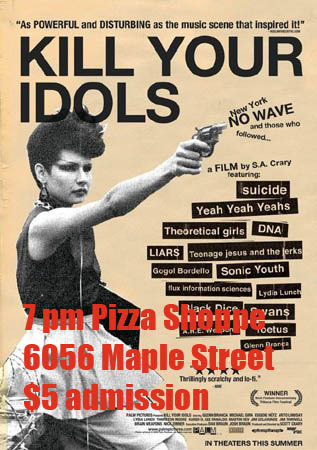 Features, Sonic Youth, The Yeah Yeah Yeahs, and Lydia Lunch. Local film maker, Jesus Narvaez, brings you a tale of terror and dark speculation. Admission $5- for both films! 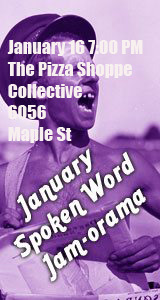 Don't forget, you'll be at The Pizza Shoppe, so there will be great food and drink available. Please come on down and support some independent films you can't see anywhere else in town. You can find the event on Facebook here. We will be supporting The Omaha Food Bank with this show. There will be no cover but donations of canned goods and cash will be accepted. August Samurai shows posted soon.